Mod The Sims - -Phae's Phone Book- Look Up Neighbors' Numbers! Well this is one of those 'took way too long' projects. Echo has been helping me out immensely with this since December. We had it almost done back in March when we ran into base game compatibility issues. After another 3 months of trying this or that or the other, I've figured out that its not likely possible to become basegame (or uni only) and to just release it as is. You need any EP above Uni to use this, it doesn't matter which though so I've not marked any of them as requirements so it won't get filtered out for someone who still could use it. After that long disclaimer, what is it you ask. What has Phae been working on? Drum roll please! dadadadadadadad tata! A Phone Book! A phone book! That's nothing new or special you say. Well, that's where you are wrong! This is a very special phone book. It actually does stuff! You can actually walk up to it, think about what you want, and then find one of your neighbors (any callable sim in your hood or connected subhoods) and add them to your relationship panel. You can then go give them a call if you want. This little phone book is super cool for a couple different reasons, but let's not get ahead of ourselves. It can be found in the Small Electronics section (where the telephones are, for convenience) and costs you only $50. Upon placement you will notice the fantastic little low poly mesh (242f, 357v) I created from the in-game stack of phone books for child's booster seats and an open spell book. 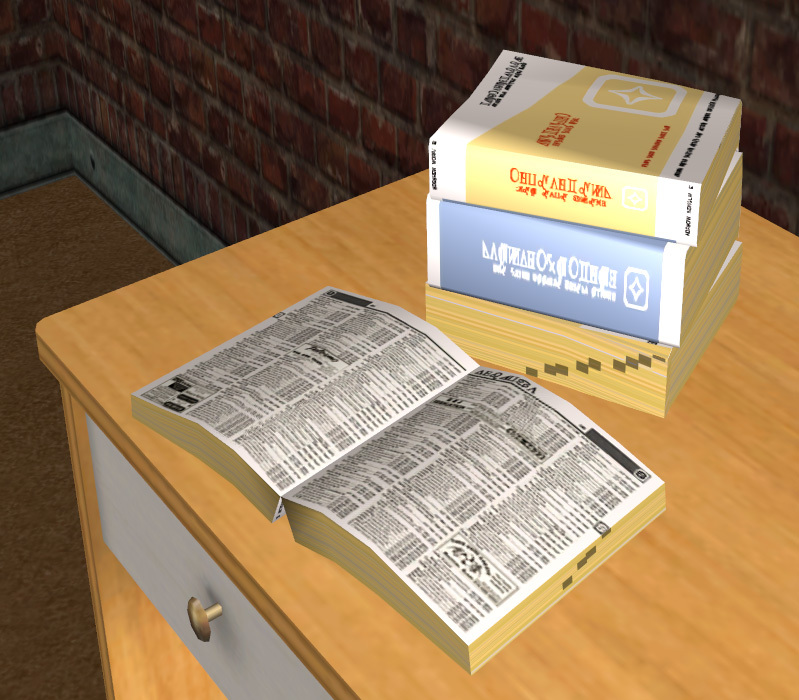 The texturing was meticulously done in Simlish, there are fun little advertisements splashed across the page, and the letter tabs match the ones on the side of the book of course. Small attention to detail is everything, no? Click on the phone book and 'Look Up Number' appears. Clicking on it will direct the active sim to walk toward the phonebook, stop in front of it, play the animation of thinking and then 'aha', and then pull up a dialog box populated with every sim in the hood and connected subhoods that is callable and that you do not already know. Browse through the sim headshot photos or names list to find the sim you'd like to add to the relationship panel and click on them and hit the check button. 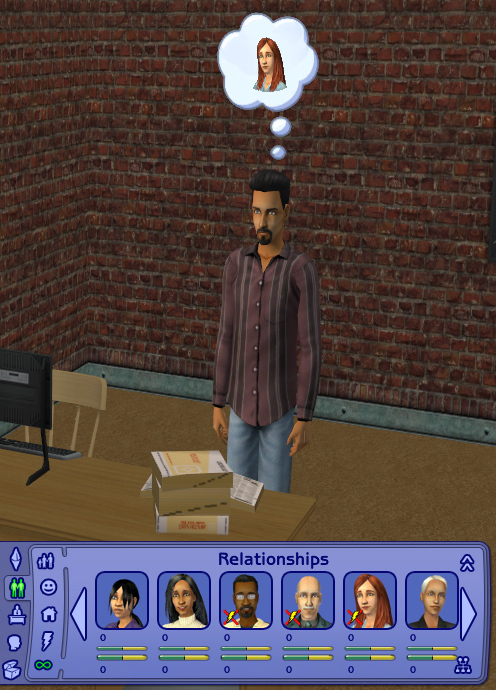 That sim will now appear in your sim's relationship panel as 0/0 and a little thought bubble will appear over your sim's head with that person in it. The other sim will not suddenly know you however. They didn't partake in the activity at all, right? Once you give them a call or do anything else that changes relationship status, then your sim will be in there's, just like normal. Cool, fine, but why do I want this? P.S. REMEMBER, you NEED any EP above Uni or it won't work. 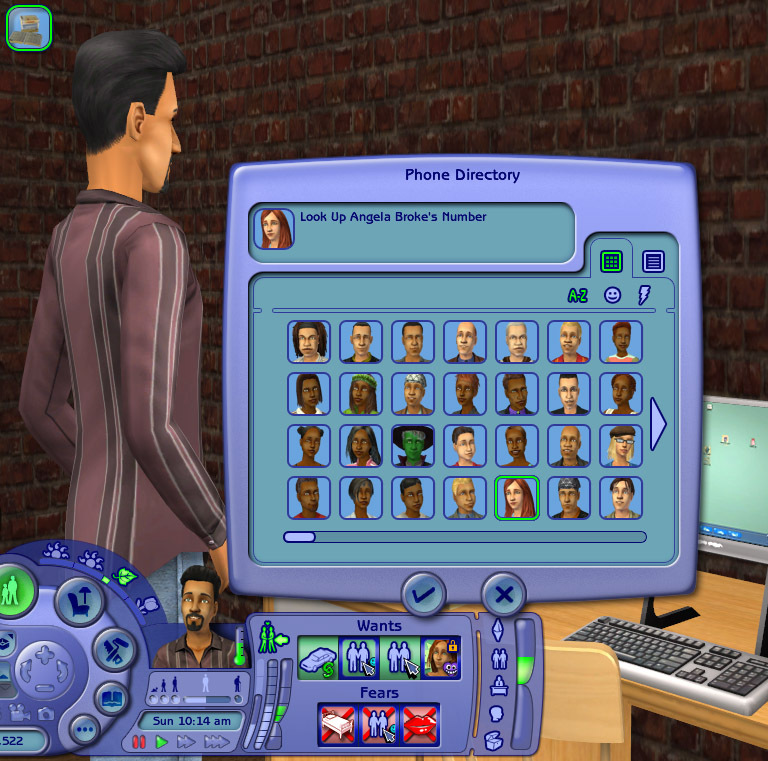 The phone book will appear in your game but the interaction will drop straight out of your sim's queue if you don't have any EPs. Huge Huge Huge thanks to Echo! She is always a source of friendly help, extreme knowledge, and this would not have gotten off the ground without her. Go click one of her thanks buttons or send her a nice Thank You PM. HugeLunatic, maybesomethingdunno, and MogHughson for their help as well. You can read all about the trial and tribulations in the OW thread. Credits to monique and her Relationship Panel which was my jumping off point before Echo pulled out and rewrote all the BHAVs I had originally borrowed. Her object works the opposite way, removing sims, until she added an add feature. My object has no way of removing any, so if you hate what you've done to your panel, I'd suggest using hers to clean it back up. Finally credits to dizzy2 for his original Call Anyone mod that inspired this in the first place. I had his mod for a while but didn't like that it auto-loaded into the phone and pulled everyone all the time. Making a phone call took 5 minutes loading time at least! Ridiculous. That's why this is a separate object and not part of the phone network. 5750 people have said thanks to Phaenoh for this download.